There’s sort of some rhyme and reason to my cheese-buying habits. One fromagerie might have the most amazing butter, so I’ll trek over to the place St. Paul to buy a packet of it. But if I want a round of Selles-sur-Cher, I’ll go to the fromager at the marche d’Aligre who always has beautiful ones on display. 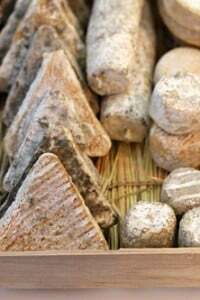 For St. Nectaire and Cantal, I’ll only buy those from the husky Auvergnate dude at my market on Sunday mornings and refuse to even taste one from anywhere else. His are just so good, I don’t bother doing any comparison shopping. Last week my neighbors from San Francisco came to visit and I took them to my Sunday market, where I figured we could gather the ingredients for a semi-homemade meal, sans the tablescape. Of course, I picked out a crispy-skinned poulet crapaudine (actually, I got one-and-a-half, since I can eat a whole one by myself and I hate sharing), we got some not-fabulous bread (my bread guy, Jacques, stopped coming to the market on Sunday—zut! ), but I dialed in on the cheese stands, since so matter how fabulous the food is in the Bay Area, French cheeses are undeniably amazing. I picked up a few tiny Rocamadours, little creamy disks made from raw goat’s milk, each about the size of a silver-dollar that barely made it home before their creamy insides running out all over my market basket. I also had a jumbo slab of Salers since I love the guy that sells it. And a herb-covered Brin d’Amour, since I love the guy that sells that too. Although in a completely different way. But the star of the show, at least for me, is Comté, which I’m told is the most popular cheese in France. I don’t know if that’s true, but it’s the most popular cheese in my bouche and I’m never without a slab. Resist the temptation to buy the less-expensive ones. They’re good, but compared with the ones aged 18 to 30 months, well…there’s just no comparison. You can be cheap about other things, but the ordinary ones have the same amount of calories as the blow-your-mind ones. So you may as well get the good ones, even at the risk of your mind blowing out. Trust me, minds are overrated. I’ve been there. Silly Americans like me always have to complicate things and when I first moved to France, I’d buy, like, ten different kinds of cheese to make a cheese plate. Not that I’m complaining, but I’d have way too much left over and it was just too much for David. And I’d spend the rest of the week gorging on cheese. Not that that’s a bad thing, but Levi’s (pronounced lev-eez) are expensive here and there’s only so many pairs a guy can bust through. So I stopped that silliness and started buying a maximum of three cheeses when having guests, usually choosing a nice goat cheese, for its tang, something soft and creamy, like Roquefort or a bleu d’Auvergne, and always a tumescent slab of Comté. But lately, I’ve decided it’s best to just have one perfect cheese, and enjoy that in all its splendor. Not only does it allow me to not feel guilty for spending more than I might think prudent, but it’s really nice to just have one incredibly delicious cheese to concentrate on. And right now, Comté is the only one on my mind. Although it’s starting to show up in a completely different place. I want to hear more about these cheese guys that you love! Then I can be distracted from my own issues with busted-out levi’s . . . .The downside of spring is the peeling off of the winter clothes before you have a chance to peel off the winter fat, eh? Apart from all things baked, cheese one of my weaknesses. I am very jealous at the thought of the no doubt extensive selection and choice of cheese you have in France. I do not even want to think about all the creamy and sharp and fragrant cheeses I have never tasted. (Not in one sitting, of course!) I have not tried Comté. Sounds like a bit of a ‘must sample’. Will hunt around and see what I can find…..
God cheese is just one of those things I absolutely must have in my house at all times. I am so jealous of all of your cheese vendor options though! I’ve got maybe three, tops. Which I’m sure means I’ve been eating some subpar comte. There is nothing sexier than a grilled Comté cheese sandwich, I tell ya. comté is really popular in france, but I think the most popular cheese is bad emmenthal :D, and, of course le clacos ! I just love comté, it has the same magical ingredient as the peanuts, that makes us grabing and eating some again and again and again ♥. One little squared piece of comté with a picture perfect round drop of honey on top of it, and i’m closer to paradise than I ever will. both flavor enhance themselves a lot, it’s unbeleivable. Comte is the best selling AOC cheese in France…..bad Emmental…as previously noted is the best seller overall. Curious about how a slab of cheese can be tumescent…but if anyone can make a slab tumescent it is you! i love cheese! but oddly i have never come across comte before! i dont think its popular here on my side of the world, but im hoping the cheese shop near my place carries it. ooooh, what a perfect excuse to go there today! Reading the word “tumescent” made me blush a little. Beautiful pictures and great post! And thanks for introducing me to the word “tumescent”! David–merci beaucoup for this post. Wonderful timing! As far as I know, it is the most popular cheese in france and with a reason… It’s also one of my favorite cheeses, I can’t really pick just one. Funny funny David – from the “tablescape” to the cheese guys. I am going out to get me some Comte’ tomorrow. You’re killing me! Among my favorite meals is “cheese night”.. where we feast on good wine, a perfect cheese platter, and a salad tossed with balsamic vinegar and olive oil dressing with crispy chunks of lardon on top! Heaven… absolute heaven! Being expats we have guests (friends who became even friendlier once we moved abroad) staying with us at least once a month and my “go to” meal for eating at home with visitors staying more than 4 days is “cheese night”. It’s easy, elegant and oh so good! When we lived in Paris I always bought my cheese at Barthélémy at # 51, Rue Grenelle. Funnily enough, the fromager never had a problem understanding my American accent when I spoke French until I ordered a bleu cheese… and then he/she never had any idea what I was requesting! “Mais, c’est le même mot en anglaise et français,” I protested each time they misunderstood my pronunciation of bleu/blue! If you get a chance, there is a wide range of Comtés at the Salon Fermiers, and it’s quite an education. Really interesting, and so many things to do and see. Also? When I buy what I can find here in the US, it irritates the CRAP out of me when the little 19 year old behind the counter corrects my pronunciation–“It’s COMB tay,” she says. I resist the urge to smack her. very amusing about the tablescape. agree with just one show stopper cheese instead of several! I envy you living in the land of real cheese, I try really hard to find great cheese here in Maine (it’s hard milking a moose!) and I have to admit some people are making a real effort, I have found a runny Camembert locally made…but you!, you have all those choices and I bet 90% of them are divine. I have to say my personal favourite is bleu d’Auvergne, I could happily live on that and that alone. I, too, am totally obsessed with Comte. I find myself going to the Cheese Board in Berkeley about every other week, each time getting a bigger and bigger piece, hoping I can stretch out the time between visits to this wonderful, but always busy store, and horrified that I am spending $50 on 1 hunk of cheese–it’s over 2 pounds at this point. But loving every bite. My guilty pleasure was finding myself alone on New Year’s Eve so I made a baked macaroni and cheese with Comte. After it was done, I started enjoying it and then I remembered I had a jar of sliced black winter truffles stashed away in my cupboard and added a slice to each bite until I had eaten the entire jar myself. That was the perfect accompaniement to Comte mac n’ cheese and a great way to start ’09. Comte (or cave-aged Gruyere) is my desert island cheese. Not long ago, in the midst of running errands, I had a sudden intense craving for it. So I pulled over to The Cheese Board, bought a hunk and ate it like a candy bar in the car on my way to the next errand. I only wished I had a bottle of wine to wash it down! But others (especially law enforcement) might look down on that, so I refrained. I’ve never told anyone about that until now. beverly, your new year mac n cheese sounds divine! 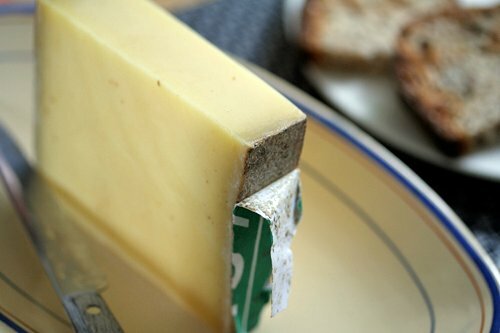 Comté with vin jaune de Jura . . .
Ah, Comté…such a wonderful cheese. And always a crowd pleaser. I agree with what you’re saying about savoring just one, quality cheese as opposed to confusing the palate with too many. These cheeses certainly look a lot more appetizing than the picture of the maggot-infested cheese you posted on FaceBook! These comments are better than the Comté commercials on French TV…! Although I do have to say a good Pélardon (from my ‘hood) is right up there. Comté and “Beaufort”, are my favourite chease! with a nice glass of white wine… Unfortunately, in France, best selling cheese are bad ementhal and Camembert, from supermarket! In France, if you buy good cheeses in a traditionnal cheese shop it’s quite expensive (20 or 30 euros/kg) but you’re shure to buy quality. On sundays evenings, I often invite my friends around a “cheese meal”: 10 sorts of differents french cheeses, good wines, an of course different sorts of breads… Mmmmm! I adore comte and those lovely little goats cheeses (I have a dream of one day having my own goat and making those little round goats cheeses by hand…. 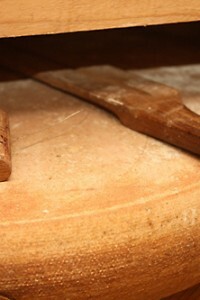 ), but what about the amazing camemberts and bries? They are so much better than what we call “camembert” in Canada…. We visited Selles-sur-Cher and I kept looking for the goats! Comté is gorgeous, but I am beginning to look forward to my trip to the Vosges in June, and buying artisanal cheeses in the market there. Fresh St-Marcellin, in particular, which I adore, and artisanal Tomme de Savoie for the Husband. (And ravioles. Toujours les ravioles….. je m’en raffole!). 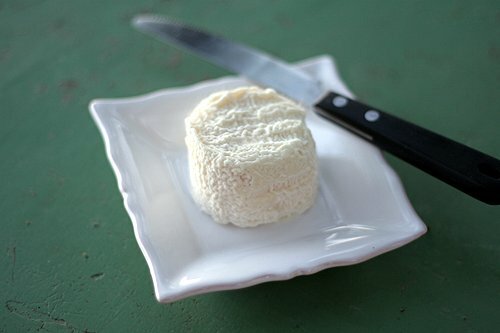 Okay, what is the bloomed rind cheese pictured at the top of your post? It looks like goat, but looks a bit tall for a rocamadour and is too white for selles-sur-cher. Mostly I want to know so I can find it because it looks like it would be heaven to cut into with a flaky, tangy flesh toward the center and more aged and oozing toward the rind. Or maybe I’m just projecting my cheese fantasies…. When I worked at a cheese shop, Comte was one of our top five sellers (the others were 5-year gouda, ewephoria, fromage d affinois and roaring 40’s tasmanian blue). I love how the salt crystals contrast with the smoothness of it. Sara: I don’t remember! I must’ve eaten it too fast. It was some chèvre, and likely didn’t have a real name. Dominique: Je ne comprends pas why anyone one would buy supermarket “camembert” when the good wheels are so close…and so good! But I guess people in the US buy American slices (that funny orange cheese that comes in slices, wrapped individually in plastic) when there’s decent cheddar just a few feet away. Accidental Parisian: You’ll have to fight for him. I think he’s a pretty popular guy…and not just for the cheese! Thank you for sparing us from the tablescape. You’ve inspired me to hit up the Cheese Cellar to gather treats for a gluttons dinner.This is the only place to buy cheese in Seattle, it’s one thing I miss about the Hamptons great cheese was everywhere. Lovely post David, and if I may can I suggest to Gwen K your posts on Neals Yard for a peep at just how England does do cheese? The best of Cheddars are often just as complex and gorgeous as Comte. Poacher, Keens, Montgomery – you can usually buy some or all of these at any good local deli or market. Please do try them and I hope you will find something you will love. Thank you for reminding me of my long held belief that cheese is a food group unto itself! jo: I second your motion on Neal’s Yard. (I linked to my visit above.) It’s really one of the world’s great places and their cheese even is carried in some of the best fromageries in Paris. I would imagine there’s other cheesemakers in the UK that aren’t as well known, but who produce excellent cheese….I love that Montgomery cheddar, too. Ahh, thank you! That’s what that was called!!! I had this cheese at Zingerman’s in Ann Arbor, MI (I know, not the same thing as France) and it was soo delicious. But I couldn’t remember the name until now. Thanks David! It was heavenly. I’ve just bought a sliver of comte at the market for $65/kg. So I KNOW WHAT YOU ARE TALIKING ABOUT!!!! You should’ve seen the expression on my boyfrne’d face when he heard how much that little sliver costs. But he changed his mind after his first bite, and I got to tell him ‘I told you so’ in a very smug manner. And I agree with you that life is just too short for cheap Comte! Christy: Yikes! $65/kg is un peu cher. That does hurt.. Normally the best thirty-month comté is around €30/kg, at most, and the regular ones are €20/kg or less. One thing you should look for is comté fruité, which usually indicates a better comté. krysalia – watch Sandra Lee (I think that’s her name) on the Food Network to find out what a “tablescape” is. You will find yourself fascinated in a horrible kind of way. Must go buy Comte now. Jean Marie> hmm… I probably won’t see sandra lee because I only have “cuisineTV” here (I’d love to have those american food networks !). But i’ll search with that name, maybe i’ll find on google :D, thanks ! Krysalia: Some of the shows are Cuisine.tv are good (I have a soft spot for Desserts with Benoit) but whenever that show with Carine Teyssandier comes on, I have to run and turn off the volume. That woman’s voice makes me fou! That Selles-sur-Cher looks so delicate. It’s like a small yarn cushion, with fine yard woven around it. 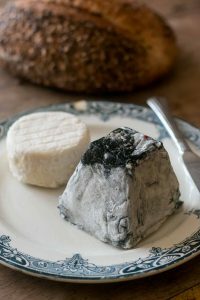 I think the goat cheese pictured at the beginning of your post is “crottin de Chavignol”. At least, it looks like it! Thank you for your marvellous blog! I agree with you david, cuisine TV has some nice shows. My soft spot is for Gontran Cherrier, really appetizing (I mean, his breads are nice, too). After tasting the 30 month old one, with the little white specks, grains of salt, difficult to settle for less. Olivier, being from Lyon where Comté is the second most local cheese after Saint Marcellin of course, eats the rind. I need to give you the little “Gaufres Meert” or they will get stale! I was at a wine tasting recently with a group of eager students. When we sat down we were given a glass for wine drinking and a knife to cut away pieces of the cheese set on a plate before us. Were asked to taste the wines and then later, sample the cheese along with the wines to see how the flavors effected the wine. The cheese we were given, of course, was the Comte. There was something quite mild about the Comte that fooled me into thinking it didn’t have much flavor. But then, as I continued tasting the wine, I realized the sweet, nutty flavors of the cheese were lingering on my palate. The flavors started so mild, so demure…and then I was finished by the cheese. I completely stopped drinking the wine and focused mainly on eating every last morsel of that tasty Comte. You’re right. The stuff is dangerous. mouahaha… HUH? “NO”. plain and simple :D.
Yumissimo is cheap too, but what I do not like and I think is cheaper is “24mn chrono”. I love laurent mariotte but in that show, the recipes and the images are so cheap it’s nearly depressing, I need two nigella’s and two “silence ça pousse” to recovery from this :) . “to recoveR from this”, sorry (and for god-knows-how-many-other mistakes I’ve made). Do you respond to old posts? I am looking to do a tour of the Comte region in France next year with some friends, any recommendations?